Honolulu, HI, February 06, 2018 --(PR.com)-- Herbavore Tools is looking to change the landscape of gardening tools: first, with its of pair of adjustable-handled scissors, and then again, with its pair of smart scissors. Rob Saito, founder, CEO and horticulturist, sprouted the idea for new invention while working at a plant nursery on his home island of Maui and noticed that he was suffering pain from ill-suited scissors. Just a few years later, Saito got his hands dirty and created the tool. It went on to win first place in a business school competition at the University of Hawaii in spring 2017. And now, the scissors will go to market in June 2018. “I used different tools 6-8 hours a day (at the plant nursery). From trowels to sickles to pruners to other types of tools you’d find in a greenhouse. I’d come home with aches and pains and, oftentimes, blisters, because a lot of these tools are only made for one hand size. And I’m not that average hand size, so it was very discomforting,” Saito said. Saito is excited to see his idea come to life and to present a solution that aims to change the landscape of gardening, cannabis trimming and farming. And his focus is good-natured. He wants to help workers overcome pain, and thus, become more productive. Saito, who holds a bachelor’s and masters in horticulture, has experienced first-hand what it's like to work with plants. He was able to incorporate that work into his product, and took it one step further. While doing his research for his invention at UH, he went to the source first. “I interviewed people in front of Home Depot and other gardening centers to get their feedback on what problems they have and pain points they have with their tools and how they could be improved. We wanted to see what peoples pain points were and how we could fix that and address that,” Saito said. Saito already has his next invention in the works: smart scissors that can track workers’ progress through data extraction. His prototype is scheduled to be completed soon. And, of course, the handles will also be adjustable. The smart scissors are estimated to be available June 2018. 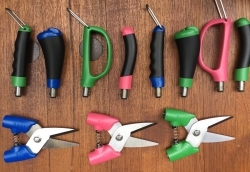 Pre-order the adjustable scissors now at www.herbavoretools.com and receive a discount. Garden tool company out of Honolulu, Hawaii looking to reshape how people use garden tools.